Citation: Sivakumar J. Volvulus with small bowel diverticula. Case Rep Surg Invasive Proced. 2017;1(3):1-3. Chronic abdominal pain, Small bowel diverticulosis, Chemo-radio-therapy, Hypochondrium, Bowel ischaemia, Bowel diverticular disease. Diverticula are sac-like protrusions of the bowel wall and occur throughout the small and large bowel. Small bowel diverticula are usually asymptomatic and are discovered incidentally. Small bowel diverticula were first reported on autopsy by Cooper in 1907. Small intestinal diverticulosis refers to the clinical entity characterized by the presence of multiple saclike mucosal herniations through weak points in the intestinal wall. A 67-year-old male presented with a two year history of rightsided abdominal pain and loss of weight for investigation. This was on a background of melanoma which was removed the year prior to this presentation, and throat squamous cell cancer that was managed with chemo- and radio-therapy a decade prior to this presentation. He reported worsening of this pain in the last six months, in which the frequency had become daily, and lasting for several hours, relieved only with lying on his left side. The patient additionally noted weight loss of 30 kilograms over two years which was considered secondary to his poor appetite. He did note that his bowel habits had been unchanged and that he had not had any per rectal bleeding, fevers, or vomiting in recent history. On examination, his abdomen was soft to palpate, however, he had tenderness over the right hypochondrium. Computed tomography imaging of his abdomen demonstrated moderate volume of intraperitoneal free fluid and free gas, as well as displacement of the small bowel into the supracolic compartment with torsion of the small bowel mesenteric pedicle, the classic swirl sign. There were, however, no discrete features to suggest acute bowel ischaemia. The patient was taken to the operating theatre for an exploratory laparotomy and an operative diagnosis was made of small bowel volvulus with a 360 degree anti-clockwise rotation, and extensive small bowel diverticulosis. Additional findings during the procedure include significantly distended bowel, and clear ascitic fluid. 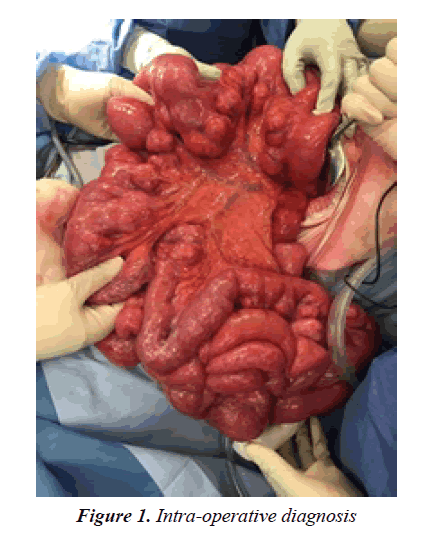 After a clockwise de-rotation of the intestines, the patient’s small bowel was returned to normal anatomical position. As the bowel appeared viable, no resection was warranted. There was significant resolution of his abdominal pain postoperatively. He recovered well, was tolerating a normal diet and had appropriate gastrointestinal function at time of discharge, a week after the procedure. Our case demonstrates a very rare coincidence of an intraoperative diagnosis of small bowel volvulus and small bowel diverticular disease (Figure 1). Small bowel volvulus is the abnormal twisting of a loop of the small intestine around the axis of its own mesentery, a condition that is typically only seen in neonates or infants in the presence of congenital malrotation. This has the potential to present as an acute abdominal emergency from the risk of strangulation of blood supply, the mortality of which ranges from 14.6% to 30% . In the Western world, the incidence of a small bowel volvulus is quite rare, however, and accounts for only 1% to 6% of cases of small bowel obstruction [1,2]. Small bowel diverticula, acquired sac-like protrusions of the intestinal wall, are also extremely uncommon. Diverticula, when present, are predominantly localized in the colon, and have an incidence of only 0.06% to 1.3% in the small bowel [3,4]. The literature of small bowel diverticular disease is largely limited to case reports due to its rarity, and several of these also describe the diagnosis being initially missed on imaging, and established only with surgery . 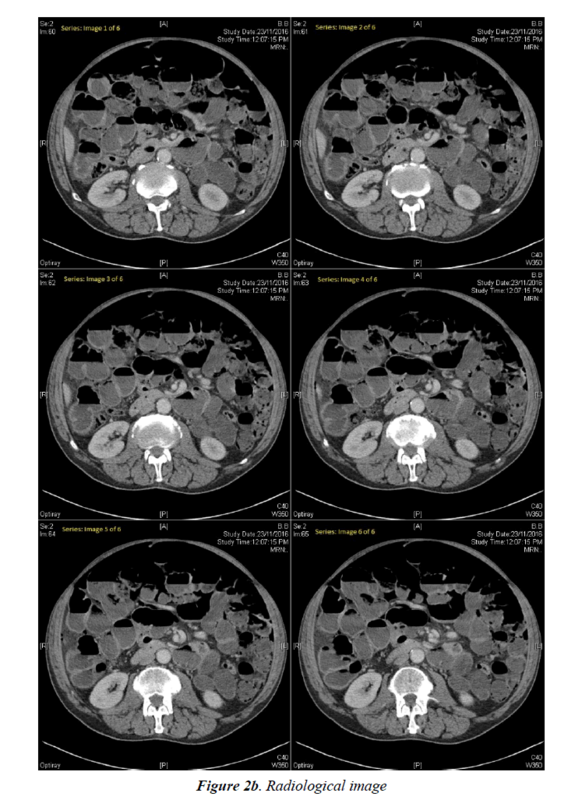 Given our patient had radiological evidence of pneumo-peritoneum; it is plausible that his underlying pathology may have been complicated by a diverticulum perforation (Figures 2a and 2b). A very similar case to our patient was described recently, with consideration that the presence of diverticular disease, and likely previous episodes of diverticulitis, led to adhesive band formation within the small bowel mesentery, thus forming a narrow root of mesentery to cause a small bowel volvulus . Acquired small bowel volvulus with small bowel diverticulosis is an uncommon entity. These images demonstrate the intraoperative findings and radiological findings. Lepage-Saucier M, Tang A, Billiard JS, et al. Small and large bowel volvulus: Clues to early recognition and complications. European Journal of Radiology. 2010;74(1):60-6. Coulier B, Maldague P, Bourgeois A, et al. Diverticulitis of the small bowel: CT diagnosis. Abdominal imaging. 2007;32(2):228-33. Surov A, Stock K. Jejunal diverticulosis. European Journal of Medical Research. 2005;10(8):358-60. Mansoori B, Delaney CP, Willis JE, et al. Magnetic resonance enterography/enteroclysis in acquired small bowel diverticulitis and small bowel diverticulosis. European Radiology. 2016;26(9):2881-91. Shrivastava A, Shukla YP, Gupta A, et al. A rare case of large jejunal diverticulum presenting as intestinal obstruction due to small bowel volvulus. The Indian Journal of Surgery. 2015;77(Suppl 1):77-8.